Our daughter became St. Thérèse of Lisieux, at least for a day. St. Thérèse of Lisieux became St. Joan of Arc, at least for a time. St. Joan of Arc heard St. Michael, St. Catherine, and St. Margaret, and she listened to them. Behind every saint are more saints—that’s not the exception; that’s the rule. We hope our daughter falls into that line. What is really going on when we imitate saints who themselves imitated saints? We practice putting on Christ. Saints have done what we are all called and challenge to do in the Christian life, beginning in Baptism: they “put of Christ” or “clothed themselves with Christ” (Rom 13:14; Gal 3:27). The saints show us what doing that actually looks like, in the end. To put on their garbs is to try on their way of putting on Christ. So our daughter put on Thérèse who put on Joan who put on other saints who put on Christ. The reason our daughter clothed herself in St. Thérèse is because her Catholic school asked her to. In fact, it was an assignment, one which all fourth graders take on (just as her older brother once became St. Maximillian Kolbe). But they weren’t just asked to dress as these saints, they also had to study them. They had to practice their words. They had to commit things to memory and be able to talk to others about them. 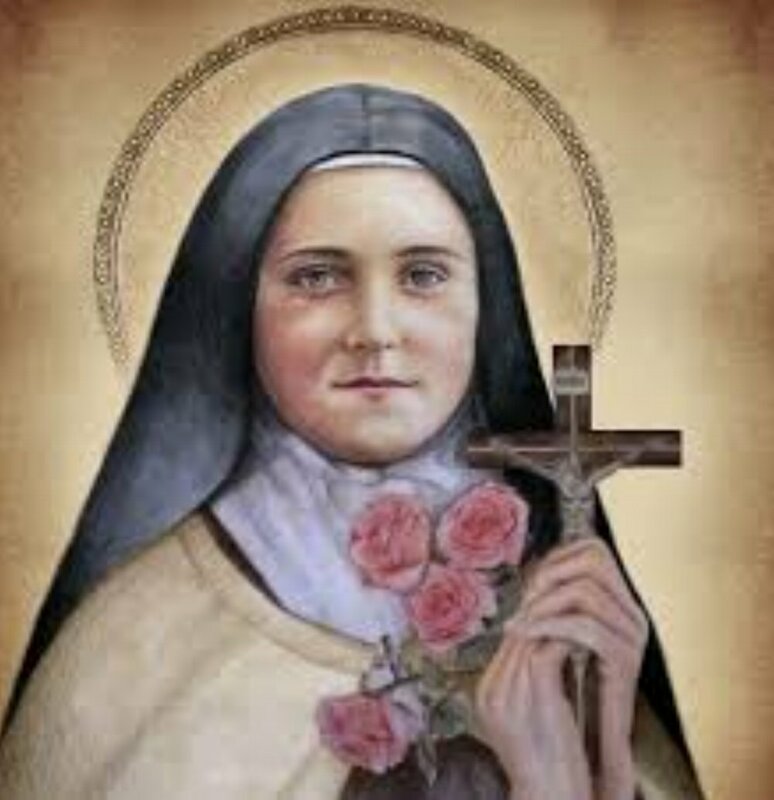 Our daughter researched her saint, she wrote facts about Thérèse on notecards, she studied the Little Flower’s prayers, and she was encouraged to organize things she discovered about Thérèse in order of importance: what is the most important thing to tell others, what’s next, and so on. Both sides of this project are important: the imitation and the study. Without study, the imitation or devotion oftentimes devolves into what Dorothy Day described as “so much pious pap” (as John Cavadini explained to me in a recent interview, to be aired Nov 3). Without devotion and real love, study merely leads to bland biography, like a human book report. It is only through the union of imitation and study, devotion and learning, challenge and inspiration that the life of the saints are revealed to us: lives “hidden with Christ in God” (Col 3:3). The fact of the matter is that what we think about, whom we imitate, and what fires our imagination ends up forming us in deep and lasting ways. I love that our Catholic school has developed this project and put it right at the center of the curriculum for fourth grade, which is right in the middle of the curriculum for the entire school. It is, in miniature, a model for Catholic education as a whole: the integration of study and devotion unto the formation of saints. We have seen this emphasis reaching down to fire the imagination of our younger kids, too. Our first-grader worked more diligently on his short study of St. Francis Xavier than on just about anything else he’s done in school to date. He wanted to read the little biographies of the saints we found. He begged his mom to read more to him. He drew pictures of St. Francis. He carefully selected the perfect image from the vast treasury a Google search yielded to print and paste to his assignment. And then, the day after he turned in his assignment, he was utterly interested in his younger brother’s own pre-K assignment, which was to color an image of St. James. So both of them huddled around their mom as she read stories about the saint, and then the pre-K student colored a cutout of the saint for his class while his older brother drew a free-hand image of the saint on a horse that was so intricate and detailed that I would’ve never guessed a first-grader drew it unless I saw him doing it. That kind of work isn’t the drudgery typically associated with completing a compulsory assignment, but truly the work of love and of wonder. I’m especially grateful for all this today on the Solemnity of All Saints. The greatest hope of all Christian parents—even when we don’t articulate it clearly or grasp it in full—is to lead our children into sainthood. We can’t do it for them, but we can form them in such a way that their love of the Lord becomes more likely, that they “put on Christ” with their whole life. Still, if parents know one thing, they know that they need help. Lots of it. Fortunately, the saints never fail to respond, in showing us and showing our children how to put on Christ. Yet we need help in discovering the life of the saints, and for that, I am grateful to our Catholic school for showing them how to do it: through imitation and study, together.